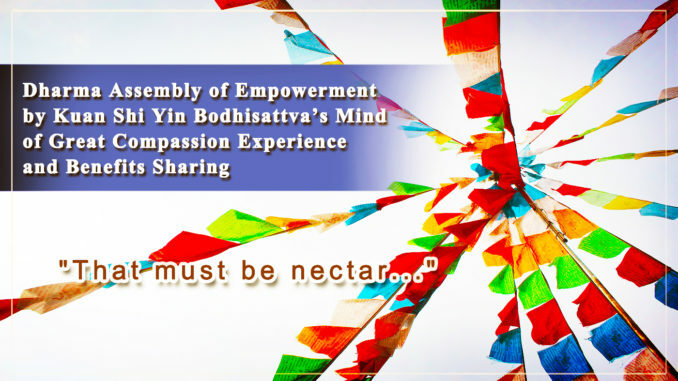 In 2009, I viewed a video of the Dharma Assembly of Empowerment by Kuan Shi Yin Bodhisattva’s Great Compassion for the first time. I was very excited at that time and wished that one day I would be able to attend such a dharma assembly too. Now I finally had that chance and good fortune to attend the Dharma Assembly of Empowerment by Kuan Shi Yin Bodhisattva’s Mind of Great Compassion. I must express my gratitude to H.H. Dorje Chang Buddha III and Kuan Shi Yin Bodhisattva. I also thank the Abbess of Hua Zang Si, Dharma Master Ruo Hui. A short while after the dharma assembly had started, I first felt that a breeze of cool wind blew by my hands. It felt very refreshing and cool. After that, my entire body became warmer and I started to sweat. I was sweating heavily all over. After the sweating I felt extremely refreshed and energized. It was very comfortable. Then I saw (My eyes remained closed throughout the dharma assembly.) pieces of white clouds floating in the blue sky. The scene was very beautiful. After a while, water started to drip from the white clouds, which was different from the feeling of raining. I thought, “That must be nectar and has blessing!” So I opened my mouth to drink it. Actually, I walked around to receive and drink it. The situation lasted until the end of the dharma assembly. My stomach felt full during the entire period. I am grateful to the empowerment from H.H. Dorje Chang Buddha III and Kuan Shi Yin Bodhisattva! This entire process was truly inconceivable.